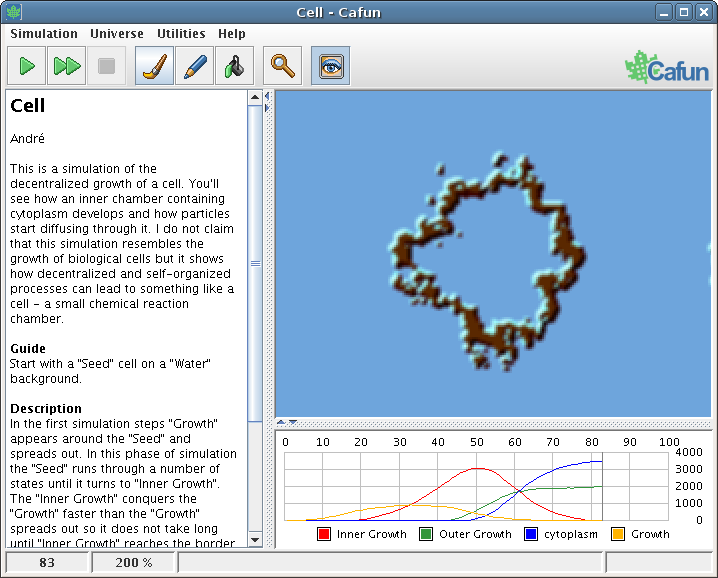 Beside the actual program, the Cafun distribution contains a set of example simulations, located below the "simulations" directory of your Cafun installation. You can use them to get a first impression of Cafun's capabilities and to become acquainted with Cafun's user interface. Furthermore, if you plan to go beyond exploring existing simulations towards creating your own, you may use them as a model, giving you insights into the way Cafun works. Cafun is implemented in the Java programming language which makes it run on multiple computing platforms, like Unix/Linux or Windows for example. All that is needed is a special software called "Java Runtime Environment", or "JRE" for short. 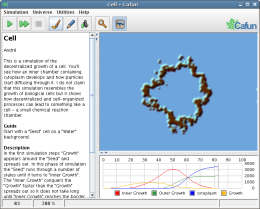 In order to run Cafun, you'll need a Java Runtime Environment of version 1.4.2 or later, which can be downloaded for free at http://java.sun.com/j2se/1.4/download.html. First make sure that you have a Java Runtime Environment of version 1.4.2 or later installed. On Unix/Linux it is especially important that the JAVA_HOME environment variable is properly set. Then all you have to do is to unzip all files contained in cafun-1.0.zip to a directory of your choice. To start Cafun Windows users will find a file called cafun.bat. All they have to do is to double-click on it. Unix or Linux users will have to execute the shell script cafun.sh. Alternatively, it is possible to start Cafun with the command java -jar cafun.jar. Cafun may be freely distributed, as long as the distribution package is not modified. Nobody may charge a fee for the distribution of Cafun without written permission from the author. You may not modify, translate, reverse engineer, decompile or disassemble the software or remove any proprietary notices or labels from it unless you have a written permission from the copyright holder. Any unauthorised use results in immediate termination of this license and may result in criminal and / or civil prosecution. All rights not expressly granted here are reserved by the author. Installing and using Cafun signifies acceptance of the terms and conditions of this license. If you do not agree with the terms of this license you must cease to use Cafun and delete it from your storage devices. Cafun is provided on an "as is" basis, without warranties of any kind, including the fitness for a particular purpose, unless such warranties are legally incapable of exclusion. The entire risk as to the quality and performance of Cafun is borne by you. Should the software prove defective, the author will not be liable for damages or any kind of loss while using this software. All copyrights to Cafun are exclusively owned by the author André Homeyer.